Butterflies face threats from several sources. The biggest threat to butterflies comes from humans. Butterflies have evolved to evade most predators (e.g., birds and spiders) through adaptive coloration of their larval, pupal, and adult life stages, but they have not adapted to evading the dangers posed by humans. The dangers to butterflies posed by humans have occurred too quickly for butterflies to adapt to them. The biggest threat that humans pose to butterfly survival is habitat destruction. As humans populate more and more of the Earth, we consequently destroy more of the plant life necessary for butterfly larva to eat. The problem in butterfly survival is that butterflies usually need very specific host plants to lay their eggs on and for the caterpillars to eat once they hatch. Once an adult butterfly emerges from its chrysalis, it can usually survive on a number of different flowers for nectar sources. So, it is really the larval stage that is most threatened by habitat destruction. 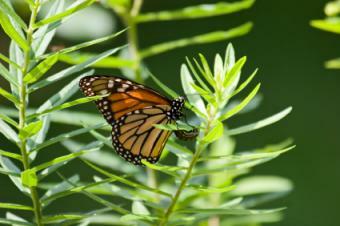 For example, the photo on this page shows a female monarch butterfly laying an egg on a milkweek plant (Asclepias spp.). The female monarch butterfly will search for a milkweed plant before laying her eggs. If she can't find milkweed, then she won't lay her eggs, and this leads to an overall decline in the monarch population. The same process also leads to a decline in other butterfly species whose habitat has been destroyed. Butterflies serve as an excellent barometer of our environment because of their sensitive nature to habitat destruction. Some butterflies are considered pests, such as the common hairstreak (Strymon melinux), and cabbage butterfly (Pierus rapae), because their caterpillars eat farm crops. So pesticides are used on the crops as a deterrent. These pesticides not only affect the butterfly and insect species that it is intended for, but also butterfly species that we are not trying to get rid of. To avoid using pesticides and to try to control insect pests from destroying our crops scientists have inserted the Bt gene into corn. This genetically altered corn is currently present and growing in the United States. According to geneticists, this corn is safe for our consumption because the Bt toxin only affects the digestive system of insects. The problem with this genetically altered corn is that Bt toxin also ends up in the corn pollen, which blows away, and lands on other plants besides corn. Research has shown that if Bt corn pollen lands on milkweed plants, that it kills monarch butterfly larva (Schappert, 2000). This suggests that it probably kills other butterfly species when it lands on their host plants as well. This indicates that genetically modified crops may be bad for our environment, even if the genetically modified crops aren't harmful to humans directly. Schappert, P. (2000). A World for Butterflies, Their Lives, Behavior, and Future. Buffalo, NY: Firefly Books.